I didn’t quite photograph myself, but for once I was as much taking part in a protest as photographing it, along with around 50 other photographers in an event organised by ‘I’m a Photographer Not a Terrorist‘ (PHNAT), an organisation set up a couple of years ago to protect photographers and the right to photograph largely as a reaction to a Met campaign which had involved posters and ads suggesting that anyone with a camera was suspicious and should be reported to them. We’ve seen case after case in recent years of people being stopped, searched, arrested and otherwise harassed, often entirely illegally, by police and also by security personnel, and quite a few have made the national news. But the PHNAT protest was more about the way that more and more areas open to the public in our cities are now privately owned and patrolled (and under CCTV surveillance) by security guards with an unreasonable attitude to people taking photographs. 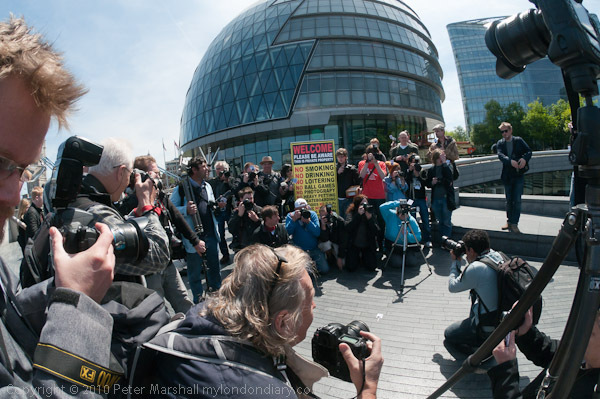 My biggest problem on the day was finding a tripod to take with me as the event organisers suggested. I do have a rather large and heavy one which used to support my 4×5, but I wanted something that was reasonably portable. It’s years since I’ve seriously used a tripod – and high ISO digital performance makes it less and less likely for my normal work, but I knew I had something smaller – but bigger than my plastic table tripod – somewhere. Eventually I ran it to earth in a box on top of my wardrobe. I decided that the 10.5mm fisheye was going to be a very useful lens on the D300, making it possible to show the photographers and also the oddly-shaped City Hall, where a little spherical effect would hardly be noticeable. At a pinch in some images I could get in Tower Bridge as well. Of course I did some pictures with the 16-35mm on the D700 as well. 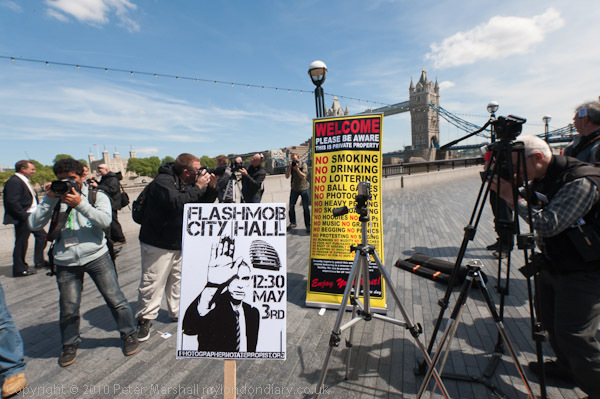 This is a 17mm picture at f20 to get plenty of depth of field, as I’m holding my own placard again. No depth of field scale on the lens, but I thought set at 2m most of the universe should be in focus. This entry was posted on Friday, May 13th, 2011 at 08:06 am and is filed under My Own Work, Photo Issues, Photographers. You can follow any responses to this entry through the RSS 2.0 feed. You can leave a response, or trackback from your own site.